We left our home port on May 19th and sailed reasonably quickly southwards and up the coast to Bergen and Brønnøysund, visiting as many of the most westerly islands as possible. We spent more time on the coast of Helgeland before sailing home again. We have reported interesting events on the way, which we hope are of interest to other sailors, family and friends. Siller Lass left Åsgårdstrand Sailing club in brilliant sunshine at 16:30. Crew Norma and Bernt. Skipper - Jon Erik. Motored among the islands to Verdens Ende. 20 nm. 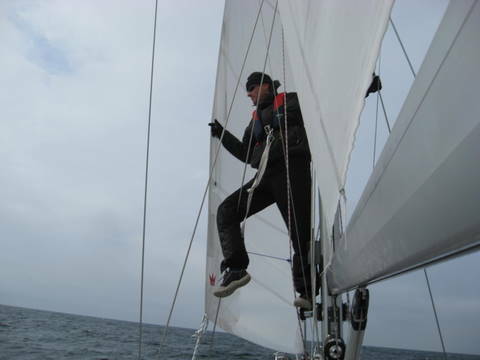 Fine calm weather gave us the opportunity to change our genoa to a hard weather jib. We expect harder weather on our way round the south coast! Sailed out at 9am. Had a bit of trouble , almost losing a batten from the jib sail. Sailng was abandoned after 45 min. due to lack of wind. Fine evening after arrival at 5.30pm, regatta for local boats and 2 Maxis on their way to Skagen. We called up HMS Nornen for a check on our Jotron Tron ARR active radar reflector. We were visible on his radar at a distance of 9nm which tallies well with Jotrons specification : 10 nm to a vessel and 20 nm to aircraft. An early morning dip, sea temp. 11 deg.C. Rather chilly but awakening! Sailed out at 9 am in sunny weather, 65 nm. Mostly motorsailing due to the light breeze in the wrong direction, with a stop for fishing where we saw several small tourist boats seemingly on the same errand. No luck though. Arrived in Mandal at 18:30 in time for an anchor dram before we relished our enjoyed dinner aboard. The guest harbour is in the town centre and well equiped but not open for the summer season before June 1st. Price kr 250 for boats 35-45ft. We increased the sales of the local fishmonger – its a luxury for us to find a really good one – next forenoon. We also replensihed our larder stock and spent some time buying more fishing equipment in the hope of catching bigger and better fish. Another important purchase was several bottles of red wine with the intention of tasting and comparing them to find a good wine for Bernt's wedding reception in June. We enjoyed a fresh prawn lunch before sailing out towards Farsund. With wind blowing 10-12 sek.m.from our destination and rough seas, we sailed inshore through some narrow chanels like Korshavn and enjoyed the views. A 4 hr. motoring/sail, 28nm. Farsund is a charming little town with several quays. The guest harbour, well known for its fantastic service, and facilities is free! Good shopping facilities. Still only very few other sailing boats to be seen. We enjoyed a delicious main course of fried ling cod from Mandal. We started our wine tasting with 2 different types and will contiue tomorrow. Farsund has many relics from the past. We payed an interesting and relaxing visit to Pakkhuset, the old warehouse, now pub.Sailing life suits us well! An early start again at 8am with wind NW, forecast at 8-12 sec./m. The best sailing conditions we've had so far! Crew Bernt was in his element while author/ chef was a bit sceptical, until the mail sail was reefed. The seas were rough! We sailed into Kirkehavn before taking down the main then motored calmly up to Isbua, where there is a guest harbour for a few boats. Price kr 100 including showers and laundry facilities. Sailing time 4hrs.40min., distance 28nm. This harboour is ancient, as seen from the rings ashore which have been used for ships much larger than ours. Ice was shipped from this little village, mostly to Britain, before the days of electricity and fridges. The old ice storage building has been restored by the local people and firms and is run as a restaurant. The summer season starts on June 20th. a bit late for us! We arrived too late too be able to buy fish from the local market unfortunately. One boat «Fant» had been lucky enough to buy ling cod for salting and drying ,for kr 20 per kilo! A refreshingly quick dip in the sea, now only 10 deg., followed by a shower on deck made a perfect start for the evening. We planned to leave before 8 am to get wind from the south, but quickly revised the plan when we woke to pouring rain and wind from the wrong direction! Enjoyed a Spanish omelette leisurely breakfast made by Bernt and left Kirkehavn at 9am when the sky cleared up a little. Our aim was to try fishing in a deep "pool" just beyond Sira Flaket. We had sunny weather with just a mild breeze, perfect for fishing, even though Siller Lass rolled around in "yesterdays" sea. No luck though so deep sea fishing was abandoned after a couple of.hours. We then motored up to Egersund guest harbour and were met by a kind harbourmaster showing us where to moor up. Distance today was 24nm. We had a glass of wine with the crew from a boat registered in Oban, Scotland. This is a small world. It turned out that the owner, Peter Flooks was a dentist and had been one of brother Rob's pupils at Manchester School og Dentistry! We had an leisurely start on Monday waiting for the fog to clear and the wind to rise for a gennaker reach to Tananger.. Filled diesel, as we left the harbour at 10 am, in brilliant sunshine. 43nm to Tananger outside Stavanger. 6 hours with time to readand discuss the world's problems. A young 60 yr relative came onboard telling us about her project – skiing over Greenland in May next year! Age is no excuse. Dinner at Hummern hotel. 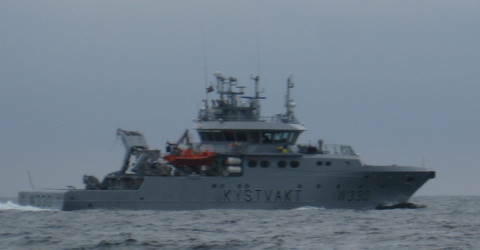 Harbour fee kr 90 . Sea temp. 11,8 deg. Hummeren restaurant: Meal excellent and delicately served.. We chose fish for both starter and main courses. From 4 possibilities, we enjoyed Marinated scampi in garlic, Scallops in filo pastry with lemon broth and pickled beetroot and Chilli marinated salmon on toast with orange aoili. The latter had only little chilli taste and a bit too much toast whereas the other two starters were great. Among 4 main fish courses we chose local Halibut with celery purèe and red salza, fresh veg. and “Ratte” potatoes and Monkfish with Olive-purèe, cherry tomatoes, sautéed mushrooms and “Pommes Anna”. Both were of high standard and most enjoyable. Two desserts were ordered. The Norwegian pankake was a bit too heavy and stodgy, the chocolate dessert, scrumptious. Bernt left for home where he has many challenging projects the next few months before he and family join us in Bodø. New crew, Ingvar og Edel Haukeland on their way to the music festival in Bergen. Short trip, 11,4 nm. motorsailing with a break for fishing .Caught our fist cod, 1,5 kg. Pouring rain at the moment 6pm. Bucketing rain as we arrived at Kvitsøy. Good lunch then a tour of the island. Fascinating and instructive – a lobster museum, a lighthouse, a colossal biulding for the traffic centre controlling marine traffic from Lista to Bømlo.. We called on chan nel 18 to to ask for wind direction and strength before leaving through Reving Sundet and we were amazed to learn that they had no direct wind measurement. It appears that the Norwegian Coastal Traffic Control is a distinct separate organization from Redningssentralen and the Maritime VHF communication run comercially by Telenor. We made a report from a visit to the British Coast Guard I Lerwick in Seilmagasinet number 4/2007. We were impressed by the coordination and professional service the Lerwick Coast guard station were able to give because they combined rescue coordination, traffick control and weather services in one operation. This combined service should be studied by the Norwegien Government. Combining these services should reduce the cost of the operation but more important to us sailors: improve professionality and service. It turned out that leaving westwards through Reving Sunned in 8m/s with old heavy seas rolling in , was almost too much of a thrill with seas breaking in the gap. Kvitsøy was a well organised community covering 365 islands with a population of only 500. Fishing is the main activity and we bought fresh cod and ling cod fillets plus some dried , salted cod to make one of our favorits dishes, bacalao, from one of the locals. Beautiful gardens full of rhododendrons and blossoming lilac and fruit trees. Well kept houses. Marina excellent with washing macnine, toilets ans showers. Start at 7:30, reefed main and our 20 sqm hard weather jib gave us good sailing all the way north to Moster The harbour was in need of both paint and polish, no facilities available. Moored outside “Saloum” from Lerwick with two seasoned sailors onboard. They knew this westcost of Norway better than us after 18 visits over the years. Moster is of historical interest. The 3 important viking kings Håkon den gode, Olav Tryggvason and Olav Haraldsson were here according to Snorre Sturlasons saga. Christianity was introduced at this time and the first church was built at Moster. This has been replaced by the old stone church with chalk murals from 1600. Marble, chalk, gold and slate have been mined on the island and one of the chalk mines has been converted to Moster Amfi, an open air stage rooming 1200 audience. Saw the rehearsel for the annual historical play and were there only 2 days too early to see the performance proper and experience our Eurovision song winner, Alexander Rybak live! Several signs about a culture path but we didn’t find it. A new guest pier is planned and another mine by the sea has been opened to let water in , giving a fine bathing area. An interesting and fertile part of Bomlø, well worth a visit. Motor sailing to Bekkarvik, an interesting little place on Selbjørn island. Very popular with sailors and motor boat folk. Being shined up for a visit of the royal family on June 16th. Won a prise in 2007 for being the best guest harbour. Of historic interest. Was given the king's blessing by King Christian IV around 1600 when he commanded the building of guest houses at sailing-day intervals along the coast. The Hanseaters stopped here often on their way up the coast. The guest house is still going strong and we enjoyed a meal fo the local wild sheep, beautifully cooked and served. Next time we'll try some of the many good fish and seafood possibilities. . The guest owners have something to be proud of - their son, Ørjan Johannesen is one of Norways prize chefs. We’ve seen few other foreign boats apart from a couple of Germans but once again a Scottish boat moored alongside.. “Topspot” from Oban with 4 aboard. We had a good chat over a whisky dram later in the evening. The owner Colin and his friend Dougal both have MAXI 1100s and have one in Norway this summer and the other on the west coast of Scotland. They switch from one boat to another, an arrangement worth copying. Coincidentally Colin and Dugald knew several of Normas family and Dugald had been taught by our nephew Bill’s father-in-law. The world gets smaller and smaller! A good night sleep despite lying in the centre of the town on a Friday.